Who, What, Why: How many soldiers died in the US Civil War? 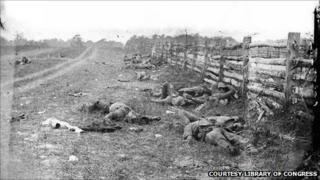 A study suggests a previously widely accepted death toll of the US Civil War may actually be way under the mark. How many did perish in this conflict, fought before the era of modern record-keeping and DNA identification? The US Civil War was incontrovertibly the bloodiest, most devastating conflict in American history, and it remains unknown - and unknowable - exactly how many men died in Union and Confederate uniform. Now, it appears a long-held estimate of the war's death toll could have undercounted the dead by as many as 130,000. That is 21% of the earlier estimate - and more than twice the total US dead in Vietnam. The Civil War began in 1861 when southern slave-holding states, fearing the institution of slavery was under threat in a nation governed by northern free states, seceded from the US after the election of President Abraham Lincoln. It ended in 1865 with the surrender of the southern, or Confederate forces, to the Union army; slavery was officially abolished by constitutional amendment that year. The war devastated the economy and society of the agrarian southern states where most of the fighting occurred, and killed so many Americans it was impossible directly to tally the dead. "The Civil War left a culture of death, a culture of mourning, beyond anything Americans had ever experienced or imagined," says David Blight, a Civil War historian at Yale University. "It left a degree of family and social devastation unprecedented for any Western society." In the 1860s, governments in the US and the Confederacy (the name the southern states took for their secessionist entity) were shoddy record keepers. They had no comprehensive system of registering births and deaths, and military muster rolls were intended more for tabulating troop strength than recording fatalities. And in the US Civil War, like all wars, men deserted or defected, bodies sank forever into the mud or were blown to bits or were misidentified, and troops initially listed as wounded in action subsequently perished from their injuries. Confederate records were largely destroyed in the war's final stages, when the Union army captured its capital Richmond, Virginia. For more than a century, it has been accepted with a grain of salt that about 620,000 Americans died in the conflict, with more than half of those dying off the battlefield from disease or festering wounds. All along, however, historians sensed that number underrepresented the death toll. Nor had any historian undertaken the mammoth task of devising and executing a new count. That was until December, when historian J David Hacker published a paper that used demographic methods and sophisticated statistical software to study newly digitised US census records from 1850 to 1880. His finding: An estimated 750,000 soldiers died in the war - 21% higher than the 19th Century estimate. "We already knew that the war was devastating," Prof Hacker says. "In one sense, increasing that total by 20% or so doesn't change that story. On the other hand, I'm a demographic historian, and we need to do the most precise job we can at determining what the impact of the war was." Prof Hacker's findings, published in the December 2011 issue of Civil War History, have been endorsed by some of the leading historians of the conflict. The publication's editors wrote that his scholarship was "among the most consequential pieces ever to appear in this journal's pages". Prof Hacker began by taking digitised samples from the decennial census counts taken 1850-1880. Using statistics software SPSS, he counted the number of native-born white men of military age in 1860 and determined how many of that group were still alive in 1870. He compared that survival rate with the survival rates of the men of the same ages from 1850-1860, and from 1870-1880 - the 10-year census periods before and after the Civil War. He controlled for other demographic assumptions, including mortality rates of foreign-born soldiers, added the relatively small number of black soldiers killed, and compared the numbers with the rates of female survival over the same periods. The calculations yielded the number of "excess" deaths of military-age men between 1860-1870 - the number who died in the war or in the five subsequent years from causes related to the war. Prof Hacker acknowledges the method must account for a large margin of error, and he declines to make bold claims about its accuracy. He acknowledges further it cannot distinguish between Union and Confederate dead, between deaths on the battlefield or from illness, nor tally postwar deaths from wounds incurred in battle. US Civil War deaths therefore could range from 617,877 to 851,066, and he settles on an estimate of 750,000 dead. "I have been waiting more than 25 years for an article like this one," writes James McPherson, author of the seminal popular Civil War history Battle Cry of Freedom, in a commentary on Prof Hacker's piece. Prof Hacker's finding "ups the ante on just how destructive the Civil War is", says Joshua Rothman, a 19th Century US historian and director of the Summersell Center for the Study of the South at the University of Alabama. "The moral weight of the Civil War is so large and the consequences of emancipation loom so large that we forget just how brutal the war actually is. It's good to remember that." Prof Hacker's figure of 750,000 would translate into about 7.5 million US deaths in proportion to America's current population, Prof McPherson notes. In proportion to Britain's 2010 population of 62.3 million, it's about 1.5 million people. Previous to Prof Hacker's work, historians had widely relied on an estimate that 620,000 soldiers died in the war, a figure reached through the combined efforts of two former Union army officers in the late 19th Century. William Fox and Thomas Livermore based their estimates on battlefield reports, pension filings of Civil War widows and orphans, and other sources that, historians have acknowledged, significantly undercounted the war dead. In any case, Columbia University historian Eric Foner questions the values of focusing on the death toll of such a horrific period in US history. "A numbers game gets us only so far in understanding the war's impact on American life," he says. "There is an ongoing debate about the number of slaves brought from Africa to the New World during the slave trade era - nine million, 12 million, 14 million. Does it really matter when we are assessing the morality of the slave trade?"